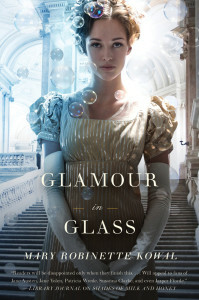 Glamour in Glass is the second book of the Glamourist Histories series, which begins with Shades of Milk and Honey. I had my first ever migraine when I read Shades of Milk and Honey, (it was before I realized that I just needed to go lie down in a dark room and reading made it worse) so for a long time, I associated this series with pain. I’m glad I got over that and decided to continue reading it, because the books are great. A little bit about the series: Shades of Milk and Honey was a romance straight out of Austen, except where one of a woman’s arts is “glamour” (magic). I love Austen, and Kowal does a great job of evoking her without copying her too much. The other books in the series feature the married Jane and Vincent, but each of them is a different genre. In Glamour in Glass, the long war with Napoleon has ended, and the newly married Vincents go to Belgium for their honeymoon and to study glamour with one of Vincent’s old classmates. However, Napoleon escapes his exile in Elba, and seems to be heading straight for them. Their relaxed trip quickly gets swallowed up in political turmoil, and to make things worse, Vincent seems to be keeping secrets from Jane. This book was more enjoyable than the first – since they are now married, Jane and Vincent are not confined by the bounds of propriety as much and talk a lot more. Jane has more interesting thoughts too, now that she is spending her days being creative and doing what she actually wants to do, rather than idling as was proper for a young lady of her time. It’s nice to see her have some culture shock too, as she realizes the ladies of France smoke, drink, and talk politics just like the gentlemen. She’s not used to thinking that she can do whatever she wants to, but she’s a quick learner as always, and she uses that in spades in the climax of the book. I keep thinking that I really want Jane and Lady Isabella Trent from A Natural History of Dragons to team up and do something cool. Jane is a little more proper than Lady Isabella, but I’m sure they would get along great. Anyway, I’m looking forward to the next book, Without a Summer, which seems to involve the Vincents investigating weather changes and crop failures back in England.